Liquid hazardous waste is an industrial waste characterized by mixtures of pigments, oils, paints, and solvents which may create a potential hazard to the environment or human health when not correctly disposed of. This type of waste is usually non-homogeneous, could be a single phase or multiphase liquid, and generally contains suspended solids. When recycling is not a choice, the preferred disposal method is to recover the inherent energy by using the waste as an alternative fuel in industrial furnaces. As per government regulations, such liquid hazardous waste fuel (LHWF) has to be screened before incineration to determine the presence of volatile and/or toxic elements above certain concentration levels. A technique is explained by ASTM D5839 for determining the trace element concentrations by Energy-Dispersive X-Ray Fluorescence (EDXRF) in typical LHWF employed by industrial furnaces. Up to 11 elements — As, Cd, Ba, Ag, Cr, Sb, Ni, Hg, Pb, Tl, and Se — can be monitored over a broad concentration range from ppm to % w/w. Due to the overlap of a potential elemental spectral line, an X-ray detector with sufficient resolution is preferred. Integrated with an advanced silicon drift detector (SDD), the Thermo Scientific™ ARL™ QUANT’X spectrometer provides the required resolution to eliminate or reduce the effects of spectral interference. This study details the analysis of a subset of six elements of interest (Cd, Cr, Ni, Ag, Sb, and Pb) in LHWF with concentration ranges from 0 to 500 ppm. In EDXRF, precision and sensitivity are realized through targeted excitation of the sample to fluoresce only the elements of interest. Better performance is provided by an instrument that has more flexibility and control over the excitation efficiency and background. The ARL QUANT’X spectrometer provides an almost limitless combination of excitation voltages ranging between 4 and 50 kV and numerous primary beam filters for optimal background control. Table 1 shows three sets of conditions used to collect three spectra per LHWF sample for a total counting time of 12 minutes. Although the analysis of sludge and liquids by XRF and other elemental methods (AAS, ICP) is generally performed in an inert gas atmosphere like helium, analyses for this research were carried out under ambient air to avoid considerable consumable gas costs. According to ASTM D5839, all calibration standards were prepared using paraffinic base oil and pure element oil standards (5,000 ppm). Prior to analysis, 5 g of the LHWF sample is completely mixed with 5 g of graphite powder (mixing grade, 44 μm, 325 mesh) for a period of 5 minutes using a ball mixer mill. When graphite is added, multi-phase liquids are homogenized and the variability in average Z is decreased. This method not only reduces the matrix effects but also enables the analysis of a wide range of LHWF samples with a single calibration. Next, 4 g of the ensuing paste is transferred to a single open-end sample cup sealed with a 4 μm-thick Prolene® polypropylene film. A total of 24 samples were prepared for the calibration, each containing all six elements at varying concentration levels spanning the concentration range of 0 to 500 ppm. Here, the study selected five concentration levels for each element, combined in accordance with a uniform experimental design (a total of 24 calibration samples). In addition, a blank and three samples with all elements at same concentration levels (10, 250, and 500 ppm) were incorporated in the calibrations. To perform the calibration, an empirical calibration technique using alpha coefficients to correct for any matrix effect was used. This technique comes standard with the ARL QUANT’X Spectrometer quantitative software package and produces excellent results in almost all applications, provided adequate standards or calibration samples are available. The regression curves for Ni and Cd in LHWF are shown in Figures 1 and 2. The plots show an excellent correlation between the corrected intensities and the element concentrations using the empirical calibration technique. The results obtained for all elements are shown in Table 2. The Standard Error of Estimate (SEE) is a measure of the variation between the measured concentration and the given concentration. A SEE of less than or equal to 5 ppm and also correlation coefficients close to 1 show the excellent accuracy of this EDXRF technique. Figure 1. Regression curve for nickel in LHWF. Figure 2. Regression curve for cadmium in LHWF. Repeatability tests were carried out on a sample containing a nominal concentration of 250 ppm of each element. The sample was consecutively measured 10 times, and during the measurements, it was removed from the instrument and subsequently replaced. Identical measurement times as that of the calibration were applied. The repeatability results and the minimum detection limits (MDL) based on peak and background intensities are shown in Table 3. As treated in ASTM D5839, similar detection limits can be anticipated for neighboring elements. Table 3. Repeatability results and MDLs for a total analysis time per condition of four minutes. MDLs expected for an analysis time of only one minute per condition are also shown. The ARL QUANT’X EDXRF spectrometer equipped with an SDD effectively measures trace elements in liquid hazardous waste fuels. Sample preparation using graphite as defined in ASTM D5839 provides a rapid and simple technique to handle the typical non- homogeneity of LHWF samples. Detection limits less than or equal to 5 ppm are yielded by a 60-second analysis time per condition under air. 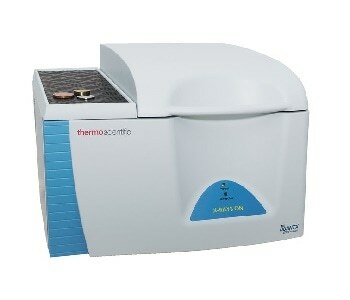 The sensitivity, speed, reliability, and ease of use of the ARL QUANT’X spectrometer make it a brilliant analytical value for laboratories monitoring an array of liquid waste samples.